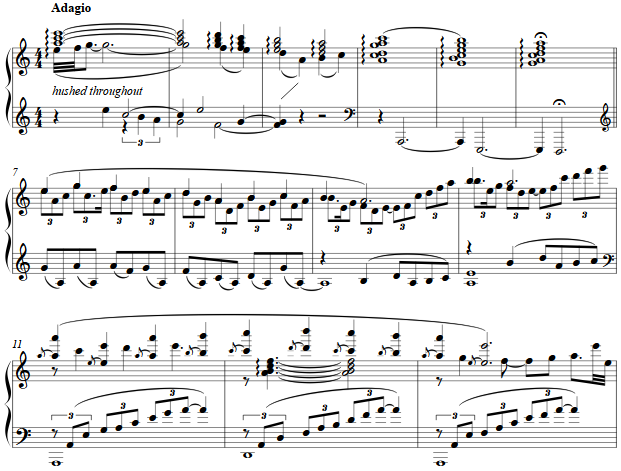 This meditation for piano is based on a melody by Mordecai Gebirtig. He was born in Kraków, Poland on May 4, 1877, and killed in the Kraków ghetto on June 4, 1942, during the National Socialists' action to deport Polish Jews to the Belzec death camp. Gebirtig was a carpenter by trade, becoming renown as a poet and composer of Yiddish folksongs. YIVO states "His ballads and song-poems were performed by foremost artists of his time, as well as itinerant street singers in the Jewish courtyards of Europe." This piano work reminds of the fleeting nature of life, its lyric saying: "Childhood years, sweet childhood years, / forever will you stay awake in my memory; / when I think of that time, / I become so regretful and grieve. / Oh, how quickly I've become old." Editorially, I shall term this song a "lullaby" for those who grow old and remember "sweet" childhood years.